While no one enjoys them, we all must navigate difficult conversations at work at some point. It is an essential leadership and communication skill, and like all skills, it can be enhanced. 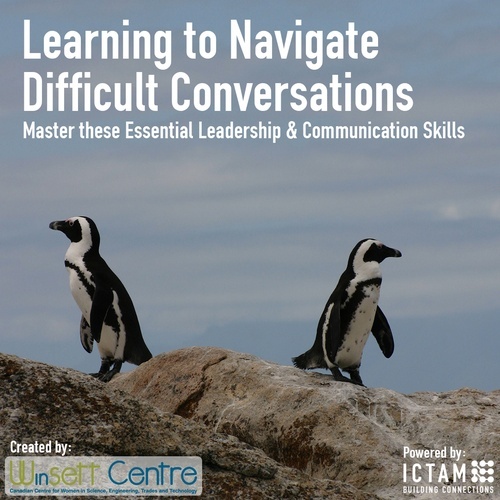 This session is focused on improving your workplace communication skills when the topic may be sensitive; the power may be imbalanced; the relationship important, and the risk of failure high. In other words, when the conversation is difficult. This session is powered by ICTAM. It was created by the Canadian Centre for Women in Science, Engineering, Trades and Technology (WinSETT Centre). doors, take the next ramp to the upper level. Go through the second set of doors. Once in the hallway, go past the box office and the Q Country hall is the last room on the left. Registration and light breakfast: 8:30-9:00 a.m.